Associated Press Michigan rockers Greta Van Fleet, performing at the KROQ Absolut Almost Acoustic Christmas in Inglewood, Calif., are up for four Grammy Awrds. 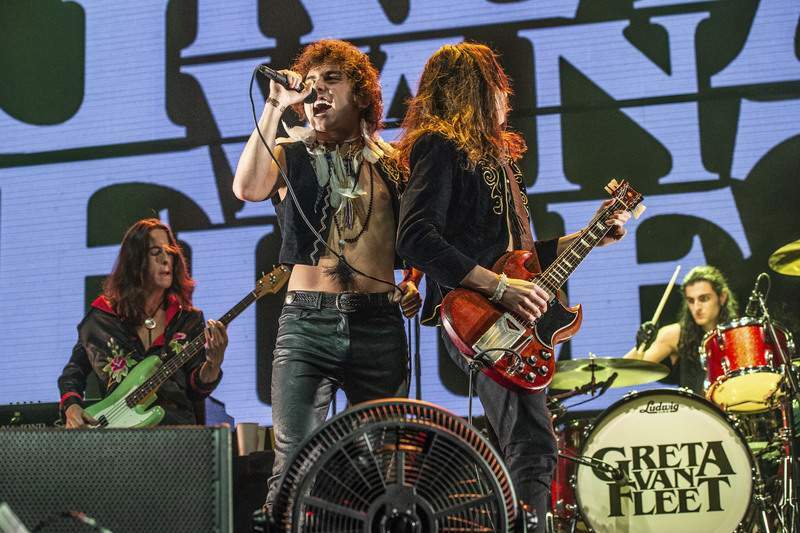 NEW YORK – When the members of the rock band Greta Van Fleet put their last touches on their first full-length album, they didn't celebrate with a round of beers or a fancy dinner. They immediately started working on new songs. Since their April 2017 breakthrough with the song “Highway Tune,” they've put out two EPs and their “Anthem of the Peaceful Army” debuted at No. 1 on Billboard's rock chart and No. 3 on the all-genre albums chart last year. It has also reached the Top 10 in Canada, Italy and Germany. They've played “Saturday Night Live” and “The Tonight Show Starring Jimmy Fallon,” count Elton John as a fan and have been embraced as the four guys who can save rock 'n' roll, a tag they politely decline. Keeping the members grounded through all this fuss is blood – three of the members are brothers. Kiszka's twin, Josh, is the howling singer, and his younger brother, 19-year-old Sam, plays bass and keyboards. The quartet is rounded out by drummer and family friend Danny Wagner, 19. At the Grammys, the band is up for best rock song (“Black Smoke Rising”), best rock performance (“Highway Tune”) and best rock album (“From the Fires” EP). Competition in those categories include the late Chris Cornell, Arctic Monkeys, twenty one pilots, St. Vincent, Weezer, Fall Out Boy and more. Greta Van Fleet, whose name was inspired by the octogenarian bluegrass musician Gretna VanFleet, also are nominated for best new artist.